In 2010 the INC (The Peruvian National Cultural Institute) and the train company have decided not to run anymore trains from Cusco Station called San Pedro Station and to operate only from Poroy and Ollantaytambo Station. Poroy Station is now the station located closest to Cusco at about 20 minutes drive from the city centre. This used to be the exclusive station for the Luxury Hiram Bingham Train and is now used for at least one train a day of all three types of trains operated by PeruRail. Ollantaytambo Station (also called Ollanta) is a popular station due to the fact that it is the last village in the Sacred Valley and hence a good option to continue after your Sacred Valley excursion to Machu Picchu. All trains from both companies that are operated to Machu Picchu stop in this station. As mentioned earlier it is a popular train station as this allows visitors to combine their trip to the Sacred Valley with the visit to Machu Picchu. This would safe you a transfer back to Cusco for the night and a transfer back to Poroy or Ollanta station the next morning. If you would like to take your train from Ollanta you have two options; or you can take a late afternoon or evening train to Aguas Calientes and spend the night there or take an early morning train from Ollantaytambo and head straight up to Machu Picchu upon arrival. As the ride to Aguas Calientes is a very beautiful one it is definitely recommended to have done the ride at least one way during day time. In case you would leave from Ollanta the same day the possibilities exists that you will not have the chance to enjoy this ride as your return train more than likely will also be in the late afternoon or evening. Also Ollanta is a much nicer village to spend the night in than Aguas Calientes and the prices are much more economical here than in the main tourist destination of Peru. Another factor to keep in mind when choosing your trains and stations is the fact that the transport in bus or car to or from Ollantaytambo to Cusco is faster than the train to Poroy. Especially for the return train, which may arrive late this may be an interesting fact to keep in mind. Following we will try to give you an overview of the different trains each company operates. 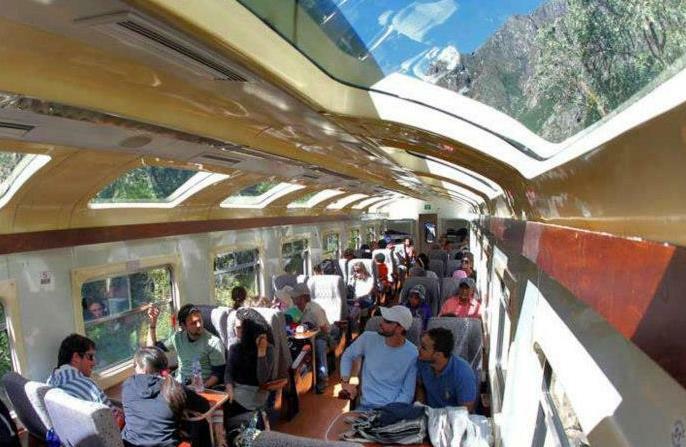 Expedition Train; This is the most economical option for the trains to Machu Picchu ever since the Backpacker train got taken out of the circulation. The Expedition train is a modern train with 4 seat s socially located in front of each other. The carriages have large panoramic windows to fully appreciate the countryside as it rolls on by. All wagons have air-conditioning, and heating. Snacks and beverages are available during the entire trip. Luggage can be stored in the racks placed above the seats. This train has departures from Poroy as well as from Ollantaytambo station. 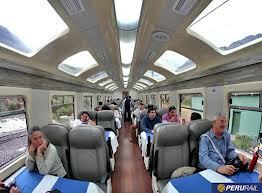 Vistadome Train; This is the very comfortable middle class train from PeruRail. The wagons have large panoramic windows and even windows in the roof of the train giving you fully the opportunity to enjoy the countryside and snap pictures al along the way. All wagons have plush leather seats with plenty of leg room, air-conditioning and heating. Snacks and beverages are available during the entire trip. The Vistadome train departs daily from both Poroy and Ollantaytambo station. Hiram Bingham Luxury Train; This is the very luxurious (and pricey) train to Machu Picchu and is one of the most famous train rides in South America. The train is a Pullman train complete with all decorations and colored in blue and gold. The wagons are all with warm and cozy interiors that feature elegant upholstery. As passengers step on board they are encompassed in a world of polished wood, gleaming cutlery and glittering glass. The train holds up to 84 passengers and has four wagons, two dining wagons, an observation wagon with bar and a kitchen wagon. Besides the train drive the Hiram Bingham train ticket also includes; brunch (Cusco – Machu Picchu) and dinner (Machu Picchu - Cusco) on board, exclusive bus return to the citadel of Machu Picchu, entrance to Machu Picchu, guided tour in the citadel and afternoon tea at the Machu Picchu Sanctuary Lodge. PeruRail also operates another train / route; the luxurious Andean Explorer Train between Cusco and Puno at the shores of Lake Titicaca. This luxury train is comparable with the Hiram Bingham Train as it also runs in a very well maintained Pullman Train and provides the same type of journey as the Hiram Bingham. This train costs only half of the Hiram Bingham Train and the journey takes about 10 hours. During the trip all meals are included and you will feel pampered with this superior service. The train takes you through amazing highlands and is a great alternative for people willing to travel in the Hiram Bingham style but not wanting to pay the high price for the Hiram Bingham. Tourist Class Train; The Tourist Class Train is the most economical option from IncaRail and provides carriages with 48 seats. The train has panoramic, UV protected windows and comfortable seats with a table in the middle. During the whole ride there will be healthy snacks and beverages available. The Tourist Class train only leaves from Ollantaytambo station. Executive Train; The Executive train is the superior level train from IncaRail. The wagons hold only 50 passengers and are equipped with panoramic windows and comfortable seats with a table in the middle. During the whole ride there will be healthy snacks and beverages available. The Executive train only leaves from Ollantaytambo station. First Class Train; This is the luxury train from IncaRail. The train holds only 30 oversized plush seats and has even more legroom than the Executive train and is equipped with expansive panoramic, UV protected windows. During the trip healthy snacks and beverages are available and there is a good selection of books about Peru and its history available. The First Class Train also only leaves from Ollantaytambo station. During the ride with the First Class Train, a healthy 4 course meal with wine is also included with the service. Presidential Service Train; the Presidential Service Train from Inca Rail is their high-end option and provides top luxury. Wagons with only 8 seats make that this journey is done in style and with personal space for each passenger. 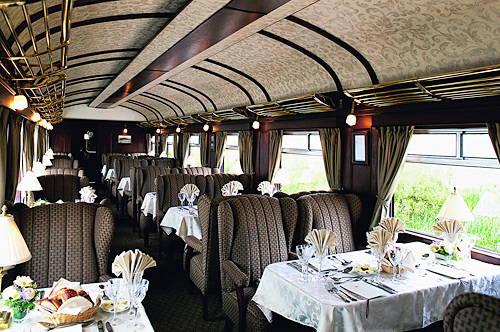 The train is decorated with wooden detail too add to the sense of luxury and during the journey you will be provided with an exquisite meal prepared by one of Peru’s famous chefs. The meal is of course accompanied with the appropriate cocktail or wine. As you can read there are several different trains for each budget and preferred level. Nevertheless keep in mind that as the train tickets available are a little more than the Machu Picchu entrance tickets, for some of the trains types – especially the Vistadome Train, due to its popularity, it is recommended to book these well in advance.